FC Bayern Munich (German: Fußball-Club Bayern München) is a German sports club based in Munich , Bavaria . It is best known for its professional football team, which is the most successful club in German football, having won 21 German titles and 14 cups. The club was founded in 1900 by eleven football players led by Franz John. Although Bayern won its first national championship in 1932, the club was not selected for the Bundesliga at its inception in 1963. In the middle of the 1970s, the club had its period of greatest success, when the famous team led by Franz Beckenbauer won the European Cup three times in a row (1974–76). In recent years they have been by far the most successful team in German football, winning seven of the last ten championships. The club's last international title was the Intercontinental Cup in 2001. Since the beginning of the 2005–06 season, Munich plays its home games in the Allianz Arena . Previously the team had played for 33 years in the Olympic Stadium . The team colours are red and white, and the team crest shows the colours of Bavaria . Bayern is a membership-based club and with more than 152,000 members. There are also more than 2,500 officially-registered fan clubs with about 181,700 members. The club has other departments for chess, handball, basketball, gymnastics, bowling, table tennis, referees, and senior football with more than 1,100 active members. FC Bayern Munich was founded by members of a Munich gymnastics club (MTV 1879). When a congregation of members of MTV 1879 decided on February 27, 1900 that the footballers of the club would not be allowed to join the German Football Association (DFB), eleven members of the football division left the congregation and on the same evening founded FC Bayern Munich. Within a few months FC Bayern Munich achieved high-scoring victories against all local rivals and reached the semifinals of the 1900–01 South German championship. In the following years the club won some local trophies and in 1910–11 FC Bayern Munich joined the newly founded "Kreisliga", the first regional Bavarian league. They won this league in its first year, but did not win it again until the beginning of World War I in 1914, which halted all football activities in Germany. In the years after the war, FC Bayern Munich won several regional competitions, before winning their first South German championship in 1926, an achievement repeated two years later.Their first national title was gained in 1932, when coach Richard "Little Dombi" Kohn led the team to the German championship by defeating Eintracht Frankfurt 2–0 in the final. The advent of the Hitler regime put an abrupt end to Bayern's development. The president and the coach, both of whom were Jewish, left the country. Many others in the club were also purged. Bayern was taunted as the "Jew's club" and as a semi-professional club Bayern was also affected by the ruling that football players had to be full amateurs again. In the following years Bayern could not sustain its role of contender for the national title, achieving mid-table results in its regional league instead. After the war Bayern became a member of the Oberliga Süd, the southern conference of the German first division, which was split five ways at that time. Bayern struggled, hiring and firing 13 coaches between 1945 and 1963. In 1955 they were relegated, but returned to the Oberliga in the following season and won the DFB-Pokal for the first time, beating Fortuna Düsseldorf 1–0 in the final. The club struggled financially though, verging on bankruptcy at the end of the 1950s. Manufacturer Roland Endler provided the necessary funds and was rewarded with four years at the helm of the club. In 1963 the Oberligas in Germany were consolidated into one national league, the Bundesliga. Five teams from the Oberliga South were admitted. Bayern finished third in that year's southern division, but another Munich team, 1860 Munich, had won the championship. As the DFB preferred not to include two teams from one city, Bayern was not chosen for the Bundesliga. They gained promotion two years later, fielding a team with young talents like Franz Beckenbauer, Gerd Müller, and Sepp Maier — who would later be collectively referred to as the axis. In their first Bundesliga season Bayern finished third and also won the cup. This qualified them for the following year's European Cup Winners' Cup, which they won in a dramatic final against Scottish club Rangers, when Franz "the Bull" Roth scored the decider in a 1–0 extra time victory. In 1967 Bayern retained the cup, but slow overall progress saw a new coach, Branko Zebec take over. He replaced Bayern's offensive style of play with a more disciplined approach, and in doing so achieved the first league and cup Double in Bundesliga history, using only 13 players throughout the season. Udo Lattek took charge in 1970. After winning the cup in his first season he led Bayern to their third German championship. The deciding match in the 1971–72 season against Schalke 04 was the first match in the new Olympic Stadium , and was also the first live televised match in Bundesliga history. Bayern beat Schalke 5–1 and thus claimed the title, also setting several records, including points gained and goals scored. Bayern also won the next two championships, but the zenith was their triumph in the European Cup final against Atlético Madrid, which Bayern won 4–0 after a replay. During the following years the team was unsuccessful domestically, but defended their European title by defeating Leeds United in the final when Roth and Müller secured victory with late goals. A year later in Glasgow , AS Saint-Étienne were defeated by another Roth goal and Bayern became the third club to win the trophy in three consecutive years. The final trophy won by Bayern in this era was the Intercontinental Cup, in which they defeated Brazilian club Cruzeiro Belo Horizonte over two legs. The rest of the decade was a time of change and saw no further titles for Bayern. In 1977 Franz Beckenbauer left for New York Cosmos and in 1979 Sepp Maier and Uli Hoeneß retired while Gerd Müller joined the Fort Lauderdale Strikers. The 1980s were a period of off-field turmoil for Bayern, with many changes in personnel and financial problems. On the field, Paul Breitner and Karl-Heinz Rummenigge, termed FC Breitnigge, led the team to Bundesliga titles in 1980 and 1981. Apart from a DFB-Pokal win in 1982, two relatively unsuccessful seasons followed, after which Breitner retired and former coach Udo Lattek returned. Bayern won the 1984 cup, then went on to win five championships in six seasons, including a double in 1986. However, European success was elusive during the decade; Bayern only managed to claim the runners-up spot in the European Cup in 1982 and 1987. Jupp Heynckes was hired as coach in 1987, but after two consecutive championships in 1988–89 and 1989–90 Bayern's form dipped. After a second place in 1990–91 the club finished just five points above the relegation places in 1991–92. Success returned when Franz Beckenbauer took over for the second half of the 1993–94 season, winning the Championship again after a four year gap. Beckenbauer was then appointed club president. His successors as coach, Giovanni Trapattoni and Otto Rehhagel both finished trophyless after a season, not meeting the club's high expectations. During this time Bayern's players frequently appeared in the gossip pages of the press rather than the sports pages, resulting in the nickname FC Hollywood. Franz Beckenbauer briefly returned at the end of the 1995–96 season as caretaker coach and led his team to victory in the UEFA Cup 1995–96, beating Bordeaux in the final. For the 1996–97 season Giovanni Trapattoni returned to win the championship. But in the following season Bayern lost the title to the just promoted 1. FC Kaiserslautern and Trapattoni had to take his leave for the second time. From 1998–2004 Bayern were coached by Ottmar Hitzfeld. In Hitzfeld's first season, Bayern won the Bundesliga and came close to winning the Champions League, losing 2–1 to Manchester United in injury time after leading for most of the match. The 1999–2000 season resulted in Bayern winning their third league and cup double. A third consecutive Bundesliga title followed in 2001, won in a finish on the final day of the league season. Days later, Bayern won the Champions League for the fourth time after a 25 year gap, defeating Valencia on penalties. The 2001–02 season began with a win in the International Cup, but ended trophyless otherwise. A season later Bayern won their fourth double, leading the league by a record margin. Hitzfeld's reign ended in 2004, with Bayern underperforming, including a cup defeat by second division Alemannia Aachen. Felix Magath took over and led Bayern to two consecutive Doubles. 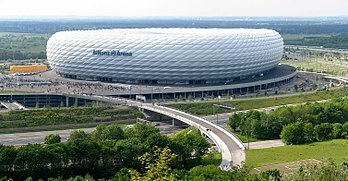 Prior to the start of the 2005–06 season, Bayern moved from the Olympic Stadium to the new Allianz Arena , which the club shares with 1860 Munich. On the field their performance in 2006–07 was erratic. Trailing in the league and having lost to Alemannia Aachen in the cup yet again, coach Magath was sacked shortly after the winter break. Bayern playing against São Paulo in 2007. Former Bayern coach Ottmar Hitzfeld returned to Munich in January 2007, but Bayern finished the 2006–07 season fourth, thus failing to qualify for the Champions League for the first time in more than a decade. Additional losses in the cup and the League Cup left the club with no honours for the season. For the 2007–08 season, Bayern Munich made drastic squad changes to help retool and rebuild. They signed a total of eight new players and sold, released or loaned out nine of their existing players. Luca Toni from Fiorentina, Miroslav Klose from Werder Bremen, and record signing Franck Ribéry from Marseille headlined the signings. The new additions paid off, as the Reds went on to win the 2008 DFB-Pokal and the Bundesliga, being on top of the standings on every single week of play. On 11 January 2008 Jürgen Klinsmann was named as Hitzfeld's successor, taking charge on 1 July 2008. He signed a two year contract. During the first half of the 2008–09 Bundesliga season, Bayern got off to a rocky start, winning just two games until day six, but started to catch up afterwards. Bayer Leverkusen eliminated Bayern Munich in quarter-finals of the DFB-Pokal. In the Champions League Bayern also reached the quarter-finals. They were eliminated by FC Barcelona after winning Group F and defeating Sporting CP in the first knockout round, achieving a Champions League record aggregate of 12–1. On April 27, two days after a home defeat against FC Schalke 04 which saw Bayern drop to the third place in the table, Klinsmann was fired. This was preceded by several disappointing results such as a 5–1 aggregate loss to Barcelona in the Champions League, and a 5–1 loss to the would-be champions VfL Wolfsburg. Former coach Jupp Heynckes was named as caretaker until the end of the season. Bayern eventually finished second, thus qualifying directly for the Champions League in 2009–10. FC Bayern then signed Louis Van Gaal for the 2009-10 season from AZ. In the original club constitution, Bayern's colours were named as white and blue, but the club played in white shirts with black shorts until 1905, when Bayern joined MSC. MSC decreed that the footballers would have to play in red shorts. Also the younger players were called red-shorts, which was meant as an insult. Bayern has played in red and white for most of its existence, but blue has been included on occasion. In the 1969–70 season the shirts were striped in blue and white, and the shorts and socks were also blue. A similar style appeared in 1995, when blue was for the first time the dominant colour. From 1999 on Bayern returned to its original colours. The club's away kit has had a wide range of colours over the years, including white, black, blue, and gold-green. Bayern also features a distinct international kit. As of 2009, the home kit is red, the away kit is dark blue, and the international kit is white. In the 1980s and 90s, Bayern used a special away kit when playing at 1. FC Kaiserslautern, representing the Brazilian colours blue and yellow, a superstition born from the fact that the club found it hard to win there. Bayern's crest has changed several times. Originally it consisted of the stylized letters F, C, B, M, which were woven into one symbol. The original crest was blue. The colours of Bavaria were included for the first time in 1954. The modern version of the crest has evolved from the 1954 version in several steps. While the crest consisted of a single colour only for most of the time, namely blue or red, the current (2008) crest is blue, red, and white. It has the colours of Bavaria in its center and FC Bayern München is written in white on a red ring enclosing the Bavarian colours. Bayern played its first training games at the Schyrenplatz in the center of Munich . The first official games were held on the Theresienwiese . In 1901 Bayern moved to its first own field, which was located in Schwabing at the Clemensstraße. After joining the Münchner Sport-Club (MSC) in 1906, Bayern moved in May 1907 to MSC's ground at the Leopoldstraße. As the crowds gathering for Bayern's home games increased at the beginning of the 1920s, Bayern had to switch to various premises in Munich. From 1925 Bayern shared the Grünwalder Stadion with 1860 Munich. Until World War II the stadium was owned by 1860 Munich, and is still colloquially known as Sechz'ger ("Sixties") Stadium nowadays. It was destroyed during the war, and efforts to rebuild it resulted in a patchwork. Bayern's record crowd at the Grünwalder Stadion is reported as more than 50,000 in the home game against 1. FC Nuremberg in the 1961–62 season. In the Bundesliga era the stadium had a maximum capacity of 44,000 which was reached on several occasions, but the capacity has since been reduced to 21,272. As was the case at most of this period's stadia, the vast majority of the stadium was given over to terracing. Today the second teams of both clubs play in the stadium. For the Olympic Games of 1972 the city of Munich built the Olympic Stadium . The stadium, renowned for its architecture, was inaugurated in the last Bundesliga match of the 1971–72 season. The match drew a capacity crowd of 79,000, a total which was reached again on numerous occasions. The stadium was, in its early days, considered to be one of the foremost stadia in the world and played host to numerous major finals, such as that of 1974 FIFA World Cup. In the following years the stadium underwent several modifications, such as an increase in seating space from approximately 50% to ca. 66%. Eventually the stadium had a capacity of 63,000 for national matches, and 59,000 for international occasions such as European Cup competitions. Many people, however, began to feel that the stadium was too cold in winter, with half the audience exposed to the weather due to lack of cover. A further complaint was the distance between the spectators and the pitch, the stadium betraying its track and field heritage. Modification of the stadium proved impossible as the architect Günther Behnisch vetoed major modifications of the stadium. After much discussion the city, the state of Bavaria , FC Bayern, and TSV 1860 jointly decided at the end of 2000 to build a new stadium. While Bayern had wanted to build a purpose-built football stadium for several years, the awarding of the FIFA World Cup 2006 to Germany stimulated the discussion as the Olympic Stadium no longer met the FIFA criteria to host a World Cup game. Located on the northern outskirts of Munich the Allianz Arena has been in use since the beginning of the 2005–06 season. Its initial capacity of 66,000 fully covered seats has since been increased for matches on national level to 69,901 by transforming 3,000 seats to terracing in a 2:1 ratio. The most prominent feature of the stadium is the translucent outer layer, which can be illuminated in different colours for impressive effects. Usually red lighting is used for Bayern home games, blue for 1860 home games and white for German National-Team home games. Bayern considers itself a national club. The club has more than 147,000 members and 2,437 fanclubs, making it the club with the largest number of organized supporters in Germany. Owing partly to the club having supporters all over the country, all of Bayern's away games have been sold out in recent years. Their following is mainly recruited from the aspiring middle class and regional Bavaria. Despite a large proportion of their supporters having to travel more than 200 km (ca. 120 miles) regularly, the club's home matches in the Allianz Arena have almost without exception been sold out. Bayern Munich is also renowned for its well-organized ultra scene. The most prominent groups are the Schickeria München, the Red Munichs '89, the Südkurve '73, the Munichmaniacs 1996, the Service Crew Munich, the Red Angels, the Tavernen Crew München, and the Red Sharks. Stern des Südens is the song which fans sing at FCB home games. In the 1990s they also used to sing FC Bayern, Forever Number One. Bayern is one of three professional football clubs in Munich . Bayern's main local rival is TSV 1860 Munich, who were the more successful club in the 1960s, winning a cup and a championship. In the 1970s and 1980s, TSV 1860 moved between the first and the third division, but lately have settled in the second division. The rivalry has therefore, at least from a Bayern point of view, lost importance, reflecting the lopsided state of the achievements of the two clubs and the absence of players for whom local grudges would still matter. On the other hand the Münchner Stadtderby is still a much anticipated event, getting a lot of extra attention from supporters of both clubs. 1860 is considered more working-class, and therefore suffers from a diminishing fan base in a city where the manufacturing sector is declining. Bayern is considered the establishment club, which is reflected by many board members being business leaders and including the former Bavarian minister president. Despite the rivalry, Bayern has repeatedly supported 1860 in times of financial disarray. SpVgg Unterhaching from the semi-rural southern outskirts of Munich, is the city's third team. They celebrated their biggest success in 1999 when they gained promotion to the Bundesliga and stayed in the top flight for a second season. Since then they have been playing in the second Bundesliga and the third division. In the 2008–09 season they will be playing in the newly founded 3rd Liga. There is no rivalry between Bayern and Unterhaching, the most notable event in the relation of the two clubs being the finish of the 1999–2000 Bundesliga season. Unterhaching defeated Bayer Leverkusen on the last day of the season, giving Bayern the chance to surpass Leverkusen in the standings and claim the title. Since the 1920s, 1. FC Nuremberg has been Bayern's main rival in Bavaria. Both clubs played in the same league in the mid-1920s, but in the 1920s and 1930s, Nuremberg was far more successful, winning five championships in the 1920s, making the club Germany's record champion. Bayern took over the title more than sixty years later, when they won their tenth championship in 1987, thereby surpassing the number of championships won by Nuremberg. The duel between Bayern and Nuremberg is often referred to as the Bavarian Derby. Since the 1970s, Bayern's main rivals have been the clubs who put up the strongest fight against its national dominance. In the 1970s this was Borussia Mönchengladbach, in the 1980s the category expanded to include Hamburger SV. In the 1990s Werder Bremen, Bayer Leverkusen, and Borussia Dortmund, emerged as the most ardent opponents. Recently Schalke 04, Bremen and Hamburg have been the main challengers in the Bundesliga. Amongst Bayern's chief European rivals are Real Madrid, A.C. Milan, and Manchester United due to many classic wins, draws and losses. Bayern also enjoys a strong rivalry with the 1. FC Kaiserslautern, originating in parts from a game in 1973, when Bayern lead 4-1 to lose 7-4, but also from the two clubs competing for German championship honors at various times in the Bundesliga as well as the city of Kaiserslautern having been part of Bavaria until the end of the Second World War. Professional football at Bayern is run by the spin-off organization FC Bayern München AG. AG is short for Aktiengesellschaft, and Bayern is run like a joint stock company, a company whose stock are not listed on the public stock exchange, but is privately owned. 90% of FC Bayern München AG is owned by the club, the FC Bayern München e. V. (e. V. is short for Eingetragener Verein, which translates into "Registered Club") and 10% by sports goods manufacturer Adidas, which is also a major sponsor of the club. Adidas acquired its shares in 2002 for €77m. The money was designated to help finance the Allianz Arena . Bayern's main advertising partner and current holder of the jersey rights is Deutsche Telekom. The main supplier of the club is Adidas. Other premium partners include Audi, Coca-Cola, Lufthansa , Nikon, Siemens, and Sony Ericsson. In previous years the jersey rights were held by Adidas (1974–78), Magirus Deutz and Iveco (trucks / 1978–84), Commodore (computers / 1984–89) and Opel (cars / 1989–2002). Bayern is led mostly by former club players. The club President is Franz Beckenbauer, who is also Chairman of the supervisory board of the AG. The Chairman of the executive board of the AG is Karl-Heinz Rummenigge, and Uli Hoeneß is the deputy chairman of the executive board of the AG. Hoeneß has been in office, formerly as general manager of the club, since 1979. After record revenues of €328.4 Million in 2007–08 and an after tax profit of €2.1 Million, Bayern reported revenues of €303.8 Million and a profit of €2.5 Million in 2008–09. According to the latest Deloitte's annual Football Money League, Bayern was the fourth richest club in the world in 2008, generating revenues of €295.3 Million. Bayern has been known to be involved with charitable ventures for a long time, helping other football clubs in financial disarray as well as ordinary people in misery. In the wake of the 2004 Tsunami the "FC Bayern – Hilfe e.V." was founded, a foundation that aims to concentrate the social engagements of the club. At its inception this venture was funded with 600,000€, raised by officials and players of the club. The money was amongst other things used to build a school in Marathenkerny, Sri Lanka and to rebuild the area of Trincomalee , Sri Lanka. In April 2007 it was decided that the focus of the foundation would shift towards supporting people in need locally. The club has also time and again shown to have a soft spot for clubs in financial disarray. Repeatedly the club has supported its local rival 1860 Munich with gratuitous friendlies, transfers at favorable rates, and direct money transfers. Also when St. Pauli threatened to lose its license for professional football due to financial problems, Bayern met the club for a friendly game free of any charge, giving all revenues to St. Pauli. More recently when Mark van Bommel's home club Fortuna Sittard was in financial distress Bayern came to a charity game at the Dutch club. Another well known example was the transfer of Alexander Zickler in 1993 from Dynamo Dresden. When Bayern picked up Zickler for 2,3 Mio DM many considered the sum to be a subvention for the financially threatened Dresdeners. The reserve team serves mainly as the final stepping stone for promising young players before being promoted to the main team. Bayern II is coached by Mehmet Scholl and Gerd Müller. Since the inception of the Regionalliga in 1994, the team played in the Regionalliga Süd, after playing in the Oberliga since 1978. In the 2007–08 season they qualified for the newly founded 3rd Liga. Since 1978, the team has been playing in the highest league that the DFB permits the second team of a professional football team to play. Bayern Munich's junior division has produced some of Europe's top football players, including Owen Hargreaves, Thomas Hitzlsperger, Philipp Lahm, and Bastian Schweinsteiger. The division was founded in 1902 and is run by Werner Kern and Björn Andersson. It consists of eleven teams with more than 170 players, the youngest being under ten. The women's football team which is led by headcoach Günther Wörle features several members of the German national youth team. In the 2008–09 season the team finished second in the women's Bundesliga. The division was founded in 1970 and consists of four teams with 90 players. Their greatest success was winning the championship in 1976. FC Bayern Munich training facilities, for both the professional and the Junior Team, are located at the Bayern Munich Headquarters. There are four grass pitches, one of which has undersoil heating, one artificial grass field and a multi-functional sports hall. Bayern is historically the most successful team in German football as they have won the most championships and the most cups. They are also German's most successful team in international competitions, having won six trophies. Bayern is one of only three clubs to have won all three major European competitions and also the last club which has won the European Cup three times in a row, entitling them to wear a multiple-winner badge during Champions League matches. For recent transfers, see List of German football transfers summer 2009. The "Greatest Ever" squad chosen by more than 66,000 fans, in 2005. The coach chosen was Ottmar Hitzfeld. Jürgen Klinsmann named Mark van Bommel captain for the 2008–09 season, succeeding former captain Oliver Kahn, who had retired after the 2007–08 season. Van Bommel was the first non-German captain of Bayern Munich. For the 2009–10 season, manager Louis van Gaal decided to stick with Klinsmann's choice of van Bommel. Bayern had 17 coaches since its promotion to the Bundesliga in 1965. Udo Lattek, Franz Beckenbauer, Giovanni Trapattoni, Ottmar Hitzfeld and, most recently, Jupp Heynckes served two terms as headcoach. * Franz Beckenbauer and Jupp Heynckes served their second term as caretaker coach. Rank = Rank in the Bundesliga; P = Played; W = Win; D = Draw; L = Loss; F = Goals for; A = Goals against; GD = Goal difference; Pts = Points; Cup = DFB-Pokal; EL = UEFA Europa League; CL = UEFA Champions League.